Why Is Store Signage So Important? 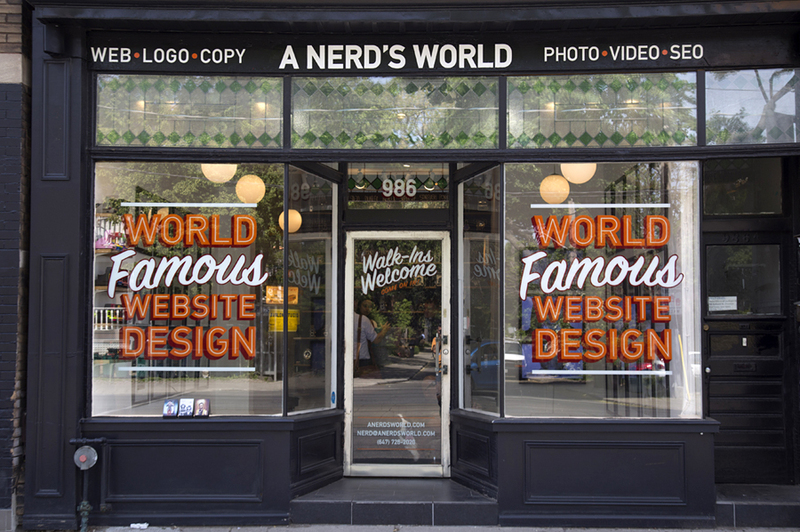 At A Nerd’s World, we opted to do something creative agencies never do – open up a retail store. Yes, that means you can literally walk in off the street, speak with one of our nerds, and order your services on the spot. We pride ourselves in standing out from the crowd while being recognized as having the best website design in Toronto – and we want that to be obvious to someone passing by on the street. Located at 986 Bathurst Street, we are just north of Bloor – at one of the busiest intersections in the Toronto. For that actor walking by in need of a new headshot or that small business owner thinking of redesigning their website – they now have the incentive to get it done, and they have a name of a local website design company in mind without having to do any extra research – even if they never step foot in the store. Our services are also listed on a sandwich board in front of the store – so everyone can see that we are not just about web design – photography, logos, copywriting and SEO are all part of our success. Clients around the world get a sense of who we are. Getting personal is important – while many of our clients are not located in Toronto – being able to show them our storefront and what happens inside is vital. We also change the storefront sign every year to reflect our passion for design – it is always evolving and so are we. It is the perfect way to show off our professional graphic design skills while acting as a billboard for our services. If you’re looking for web design in Toronto and you happen to drive down Bathurst Street – you’ll easily see our big bright sign and remember us – and that’s the way it should be.